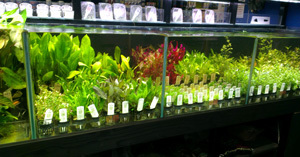 At Wharf Aquatics we have weekly deliveries of fresh aquatic plants for your aquarium. We have a huge double-sided multi-bay tank with separate sump filtration to house a wide variety of plants. One side houses good quality bunched plants, which are excellent value and include many common aquarium varieties such as Vallisneria, Egeria, Cabomba, Java Fern, Amazon Swords, Water Wisteria, Ludwigia, etc. The other side houses high quality Tropica potted plants. This includes a range of plants, from hardier and more common varieties to more demanding plants for the planted tank enthusiast. Typical stock includes Anubias, Cryptocoryne, Echinodorus, Eleocharis, Glossostigma, Hemianthus, Hydrocotyle, Hygrophila, Lilaeopsis, Limnophila, Ludwigia, Nesaea, Pogostemon, Utricularia, etc. We can also obtain most plants to order. 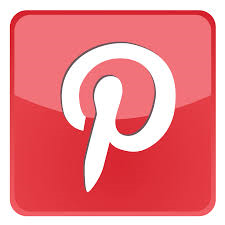 In addition, we stock plants grown onto wood and other specials. 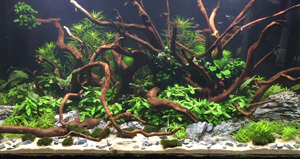 The plants on wood typically include different varieties of Anubias, Java Fern and Java Moss. We also stock a wide range of equipment for setting up and maintaining planted aquariums, whatever your level of experience. This includes liquid fertilisers, planted tank substrates, CO2 equipment and accessories. Please note that we do not currently offer plants via mail order.